The links here are organized by category. 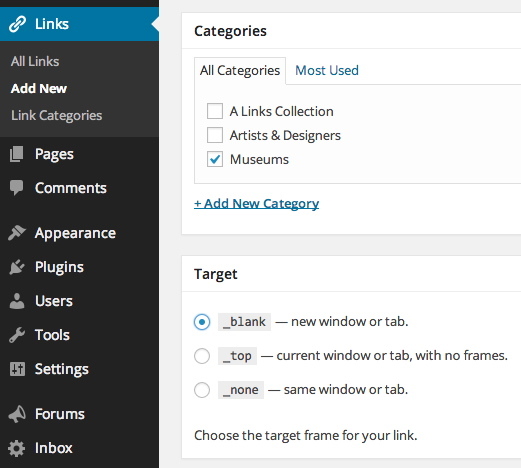 Right now, the categories are A Links Collection, Artists & Designers and Museums. The Links section of the footer has been added via a widget that you can access in the Dashboard under Appearance>Widgets. To add new links to the footer, go to the Links tab in the Dashboard. There, you can add new link categories and new links. So that your new link appears in the footer, remember to assign it a link category and target it to _blank so that it will open in a new tab. 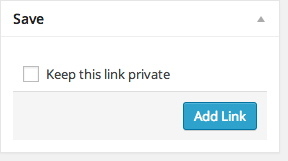 Don’t forget to save your new link by clicking the Add Link button. Once you’ve learned to do all of this, you should delete the link to this page and the category, A Links Collection, so that they will no longer appear in the footer.